I had a bit of a thing, a disastrous thing, happen over the summer. My normally entirely reliable Skoda Octavia dropped its oil on the M1. There was a bit of a beep, a bit of a flashing red light and a complete loss of power. Happily, I was just short of a junction so I pulled off the motorway onto the slip road and up to a garage just past the junction and there I waited for the nice man Skoda Roadside Assistance sent out to get me going again. I didn’t wait long, he turned up, checked under the car, pulled the sump plug out of the undertray, cleaned it all up a bit, reattached the sump plug and dropped a couple of biiiiiiig cartons of oil into the engine again. I waved him on his way and set off too. I didn’t get very far very quickly. The engine was still in limp home mode so limp home I did. It’s a long way from the outskirts of Sheffield at 40mph max, especially when you can’t really use the main roads because you’re a travelling roadblock and the back roads are too hilly for something that would lose a rice pudding skin tug of war match to an asthmatic kitten. I had hoped that the system would reset after a prolonged shut down so I turned it off when I got home and turned it on again in the morning and miracle of miracles, it hadn’t. This long preamble is to set up how I lived the road tester’s life for a couple of weeks. Skoda sorted me out with a courtesy car. They asked if I would prefer a manual or an automatic and I said either would be fine. Really. I just want to get to Birmingham tomorrow and to London the day after. How long would my car be off the road anyway? They sent me a very nice, very black, complete wanker-spec Audi A3 S-line saloon . I hated it. It was like sitting in a coal scuttle. It had a black leather interior, a sat-nav I couldn’t really operate and no owner’s manual. I think it was a 1.6 TDi because while it was brisk, it was no brisker than the Octavia. I tried playing with the suspension settings because it had that Drive Select thing. My advice is to leave that thing in Comfort and ban anyone else from ever touching it. That lasted a couple of days before Vindis called and said they needed my car for longer and could they swap me into one of their courtesy cars because this one was costing them a fortune. I said of course, no problem. I got a rather pretty little VW Polo. I think it was an SE. It had Apple Car Play instead of a sat-nav which was fine except Google Maps ate all my data. It was a petrol, of course, there no longer being any diesel Polos. It had air conditioning which worked, it was fairly quiet, very smooth on the A-roads, visibility was excellent and I was extremely happy with it. It’s only flaw was a lack of cruise control. I mentioned this to the very nice Jack from Vindis in Cambridge when he called me to check on how things were. I said I had a few long journeys to make and I would prefer to have cruise control. He got me a car with cruise control. He got me the Skoda Superb estate in the pic at the top of the page. It was a 1.4 TSI with a DSG and radar-guided cruise control. Reader, I would have married him. It was bliss. The car was in Sportline Plus spec and must have belonged to some poor salesman who was turfed out of it in the interim. His front door key was in the cubby between the seats. The key was oddly cold because of course that cubby was air-conditioned so your choccie wouldn’t go all melty in hot weather. 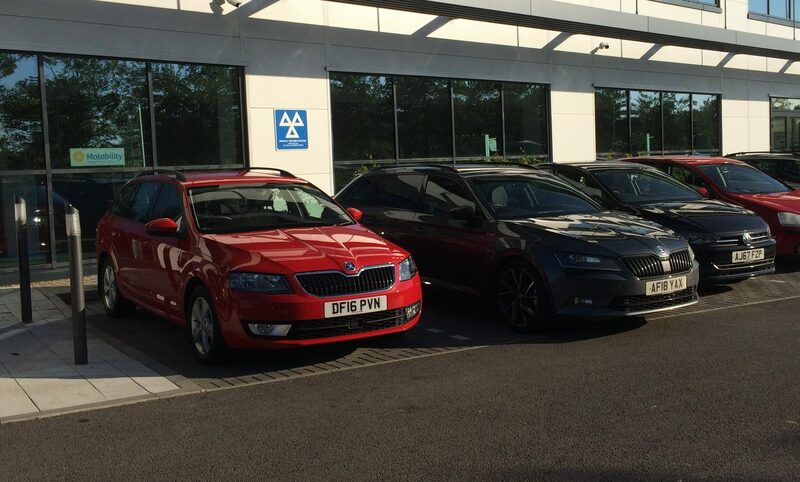 Must be one of those Skoda “Simply Clever” ideas. The radar cruise worked brilliantly once I learned to trust it. It made driving in heavy traffic next to stress-free. The seats were heated, covered in diamond-stitched alcantara, electrically adjustable and comfortable enough for me not to notice my bum, back or legs at all even after a return trip to Leeds. That’s a 360 mile day. The hatch was one of those motorised jobbies and it worked quickly enough most of the time. It didn’t always close completely though. I came back twice to find it wide open. I learned to watch it close before I walked away. KESSY is a great name for a sci-fi girl you’re not supposed to like much. It’s also Skoda’s name for keyless entry and start. It’s one of those things that Real Men are not supposed to like. I liked it quite a lot indeed by the end. I never found the umbrellas. I forgot about them, to be honest. It was summer and it was hot and I suppose I could have used them as parasols but I didn’t need to keep the rain off. The Superb is a large car. It has a boot the size of Chartres cathedral. It had no problem at all swallowing my new Specialized race bike when I went to collect it. I flopped down the seats and slid the bike straight in. I didn’t have the little release levers in the boot the Octavia has. They’re a £90 option. They really ought to be standard. Likewise, the Octavia has very good auto-dipping headlights. The Superb’s LED headlights had to be operated by the spoiled troglodyte behind the wheel. I liked the peace and quiet afforded by the engine and gearbox. Even just mooching along, I prefered the gearbox in sport mode. I tried manual mode once using the little plastic paddles on the steering wheel but it felt weird and wrong, like taking your cat for a walk. I was smitten by the Superb. It lived up to its name. It’s on the shortlist to be the Octavia’s replacement. The petrol engine wasn’t quite economical enough and I would probably have a diesel. The Audi isn’t on the list. Too small, too dark, and everyone hated me for 48 hours. The Polo, however, could be. It just needed cruise control and some more storage round the interior. Everything else about it was just fine and dandy. It just wasn’t Superb.